Welcome to another Watercooler Wednesday challenge! These challenges have been such fun, allowing me to try out the new In Colours, stamps and tools that I recently ordered. In this challenge, you can use 3, 4 or all 5 of the new In Colours on your project; and of course you can add any neutral colour as a freebie. Mason jars are such a huge trend in home decor these days; Stampin Up! was right on the ball (see what I did there – Ball mason jars!) in bringing this bundle out now. The best part – you can Bundle the stamp set (which has 37 stamps!) with the Framelits, and save yourself 10%. Because you cannot get just the stamps, or just the framelits, trust me on this one! I started with a card base of Dapper Denim cardstock, and layered a panel of Sweet Sugarplum cardstock on top of that. I took my Whisper White panel, and stamped the outline of the jar in Dapper Denim ink, after stamping off once. I then stamped the water, also in Dapper Denim, but I stamped off twice, to keep it lighter. I then stamped the stems in Emerald Envy – I used a combination of stamping full strength, stamping off once, and twice. (the former florist in me just had to get those stems into the water! LOL) I just love how you can easily achieve such different depths of the colour, simply by stamping off! 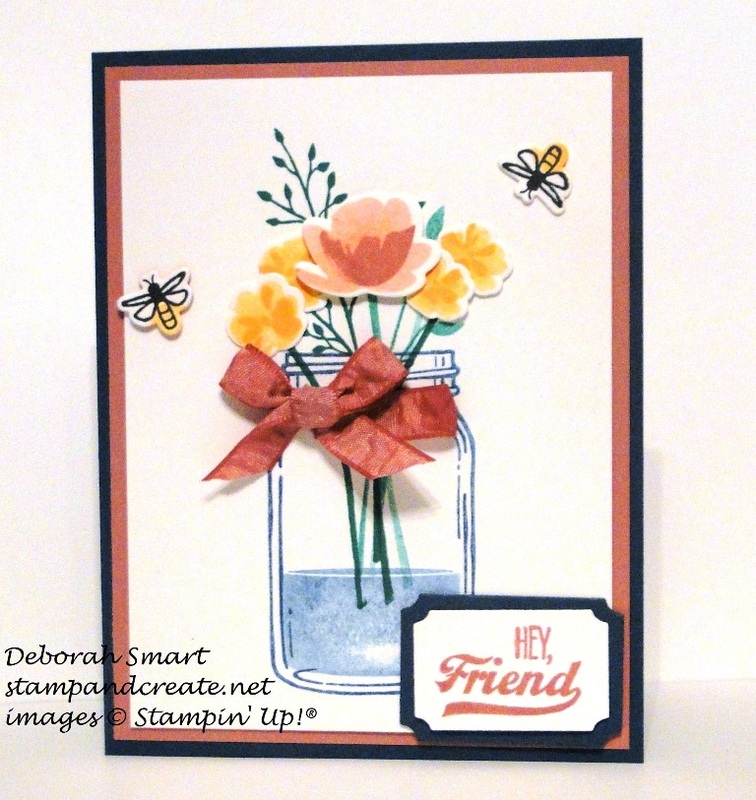 The adorable flowers are 2 steps stamps – the smaller ones were stamped first in Peekaboo Peach stamped off once, then the small detail stamped full strength. The one larger flower was stamped in Sweet Sugarplum – again, first stamped off once, then full strength. I used the coordinating Everyday Jars Framelits and my Big Shot to die cut them, and layered them over the stems, using Glue Dots and Dimensionals, so that they do look like an arrangement. How about those cute little fireflies! I stamped them in Basic Black Archival ink ( my neutral), and the used a small round dot image stamp and Peekaboo Peach ink to colour in their little tail lights! Of course, there is a framelit for die cutting them, too! 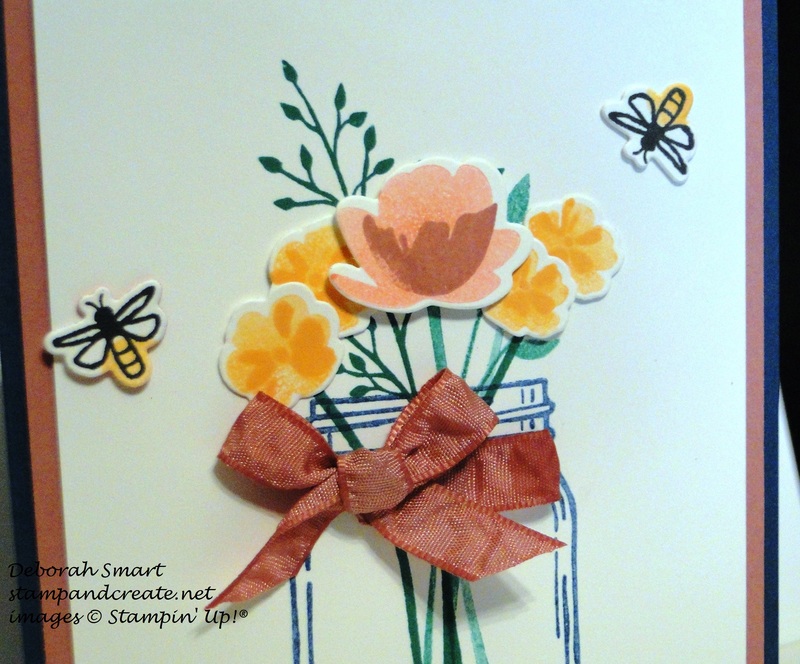 I attached them, buzzing around the flowers, using Stampin Dimensionals. The sentiment was stamped in Sweet Sugarplum ink onto Whisper White, and it and the Dapper Denim layer behind it were die cut using the Big Shot and the Tags & Labels Framelits. After attaching my stamped panel to the card base, I added the new Ruched Ribbon in Sweet Sugarplum around the neck of the jar, and added a bow to finish it off. What do you think – I hope you like it. If you have time, I always love to read any comments you care to leave. Now, you will definitely want to check out what the rest of the Watercooler Artists have designed for your inspiration – please have a look on the Watercooler Wednesday page. Then, I hope you will create your own card or project, using your new ink pads, and link up for the challenge. I will be looking for you! Until next time – happy stamping. Deb, what a lovely card. I like every aspect of it, from the stamped off flowers to the little fire flies. I don’t often use all these in-colors together, but you sure made it work. Oh Deb I’m so mad at you right now, but in a good way. You see I have the old Stampin’ Up! Perfectly Preserved Mason jar set and thought, no I’ll pass on the new Jar of Love. But then, I see your beautiful card and it’s got me hook line and sinker. Now I have to add this bundle to my next order. Thanks for your creativity and imagination Deb you always inspire me.